Here’s a quick guide on how to set up the WordPress app on your iPhone or iPad. This means you can add blog posts & pages on the move. Once logged in, you’ll see a list of sites you’ve added. Tap the site you want to work on. 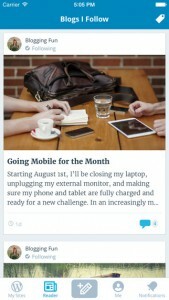 To add a blog post or page, tap blog posts or pages, then the + symbol top left. Type the post title & the body of your post or page. You can also add media by tapping the attachment icon (bottom left, above the keyboard). Once done, tap post & set visibility settings, including adding a featured image to the post. For more help on the WordPress App, see the WordPress for iOS forum here.